Counter-terrorism officers investigating the attack arrested 12 persons following searches at addresses in London and the Midlands. Two men have been charged with wounding with intent to do grievous bodily harm on the retired officer. 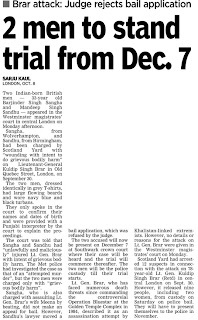 Barjinder Singh Sangha, 33, of Wolverhampton, and Mandeep Singh Sandhu, 34 of Great Barr, Birmingham, are due to appear at Westminster Magistrates' Court. 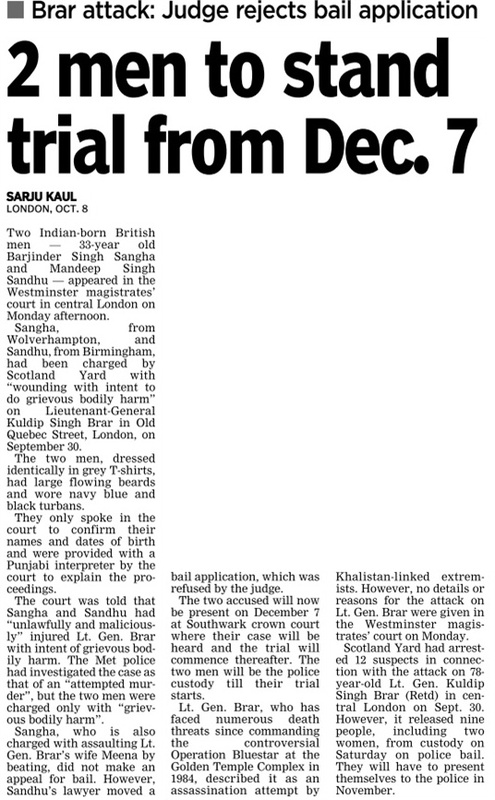 Sangha is also charged with common assault on Brar's wife Meena. 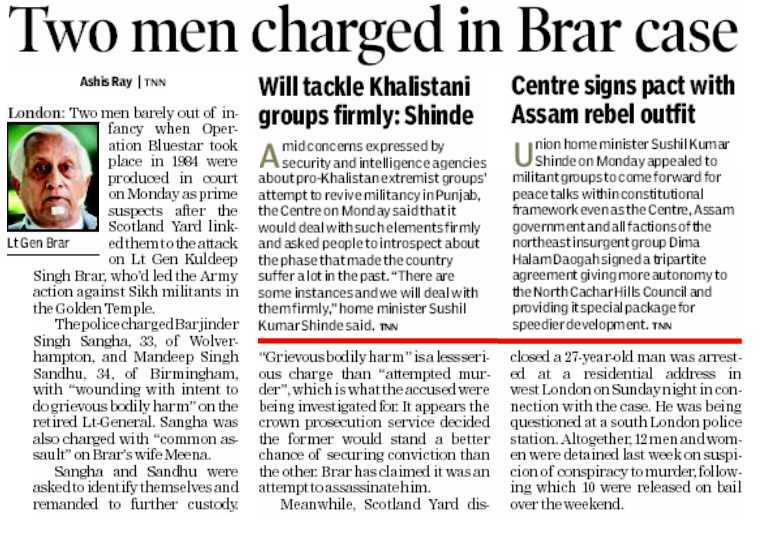 Brar suffered a wound on his neck and cheek but his wife was not injured in the attack. The decision by Russia to defer by five days the visit of its Defence Minister Anatoly Serdyukov to India for the annual Inter-Governmental Commission on Military-Technical Cooperation was viewed by many as a snub to India amid reports of growing bilateral relations between Moscow and Islamabad. The decision to reschedule the bilateral meeting to October 10, instead of October 5, attracted considerable attention, especially since the intimation of the postponement came closer to the event and coincided with reports of Pakistan army chief Ashfaq Kayani’s visit to Russia. Emerging relations between India’s tried and trusted friend Russia with Pakistan, once considered close to Washington, has neither come as a surprise nor is the changing nature of defence ties between New Delhi and Moscow to those formulating policy in the Defence Ministry. Over the past five years, the traditional dependence of India on Russia for military wares has come down and there is a gradual shift towards the United States and Europe. While India continues to depend on imports to meet up to 70 per cent of its military equipment, the share of products being procured from Russia had shown an overall decline. From over 80 per cent of imports from Russia during 2006-2010, the share of Moscow is sliding even as the country remains one of the leading exporters of arms and military hardware worldwide after the United States. India, which depended largely on Moscow for its military equipment requirements during the Soviet Union-era, continues to face problems in the form of steady supply and quality of spares. One of the reasons for it is that the Soviet defence industry was spread across various parts and after the break-up, these manufacturers remain located in different countries. It is said even now, Russia has not been able to establish a coordinated mechanism and consolidate its industrial military supplies base to the benefit of its existing customers. The other issue is that Defence Procurement Policy that the Government of India has put in place mandates minimum 30 per cent offsets for orders valued over Rs 300 crore, which means the Russians will have to source the products from domestic suppliers. 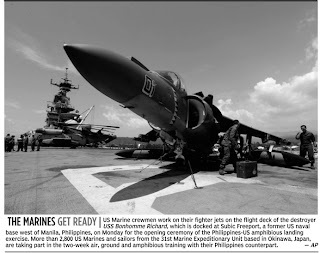 The Western military manufacturers have been quicker to move into this area, while the Russians largely rely on existing tie-ups with Hindustan Aeronautics Limited and other defence Public Sector Undertakings with whom it has such arrangements. 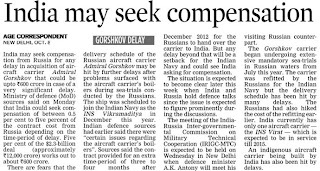 Adding to the woes is the delay in handing over aircraft carrier INS Vikramaditya (Admiral Gorshkov) which, according to reports from Russia, cannot be delivered before the fall of 2013 as against the scheduled date of December 4, 2012 that was said to be ‘set-in-stone’. As against these two handicaps, the Russians are rated high vis-a-vis India on the crucial issue of transfer of technology, something the Americans are extremely wary in allowing access to critical high-end technology items without any strings. 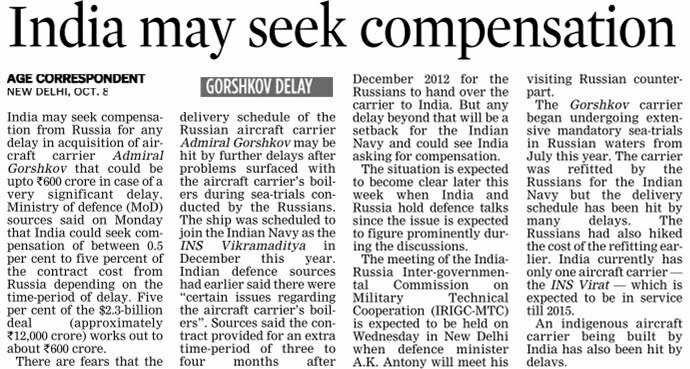 It makes Russia stand out in allowing lease of the nuclear-powered submarine INS Chakra to the Indian Navy for the second time in its history or in its quest to build an indigenous INS Arihant, the first of the nuclear submarine at Visakhapatnam docks, or the collaboration to co-develop Fifth-Generation Fighter Aircraft among others. Even though India and Russia maintain that bilateral defence ties have moved beyond buyer-seller relations, the altering landscape in which Moscow lost out to the western nations cannot be understated, including the race for the prized $11 billion Medium Multi-Role Combat Aircraft. Faced with a whopping cost of Rs 58,000 crore, the Ministry of Defence has shelved a proposal of the Indian Army to procure attack helicopters for its arsenal. The Indian Air Force currently has a fleet of Mi-35 attack helicopters. The Army Aviation Corps, which was formed in November 1987, flies light helicopters largely in the mountainous regions. Sources say one of the reasons that the existing arrangement will stay is the fact that the IAF has created facilities for the repair and maintenance of these helicopters at its forward bases. The IAF and the Army have a 1986 agreement on the allocation of air assets. Attack helicopters come under the command and control of the Army, but the IAF pays for the machines, maintenance besides training the pilots. The helicopters are tasked with the Army’s strike corps and are good at taking out enemy tanks. 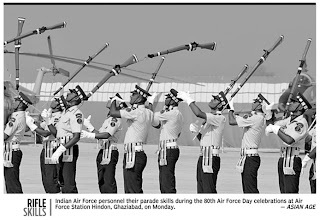 The capability to carry out heavy airlift operations and conduct flights in attack formations are handled by the IAF and will remain so with the IAF for now, the source said. 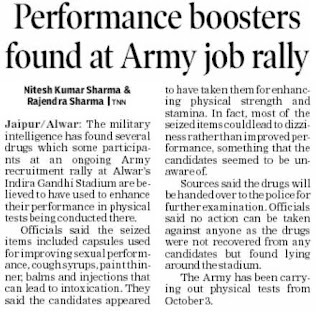 The MoD turned down the Army demand as it would have required creation of facilities from scratch. The Apache attack helicopters will also come under the IAF. VADODARA: Over 1,500 veterans, widows of personnel and handicapped soldiers of the Army, Navy and Air Force from areas of central and southern Gujarat attended an ex-servicemen rally at the Air Defence Regiment ground at Makarpura on Sunday as a part of the Veterans Year celebrations. The rally was held in an attempt to reach out to 8,500 veterans of all the three wings of the Indian defence force from the southern districts of Gujarat. Stalls were put up to offer assistance on pension, health, insurance, education, placement and recruitment, to resolve problems of ex-servicemen and spread awareness about various rehabilitation and welfare schemes. 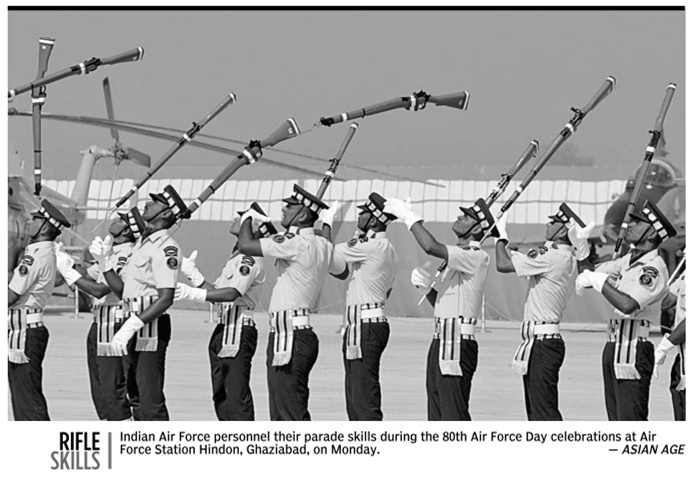 The veteran's rally was conceptualized and organized by station headquarters, Vadodara, and the Air Defence Regiment. 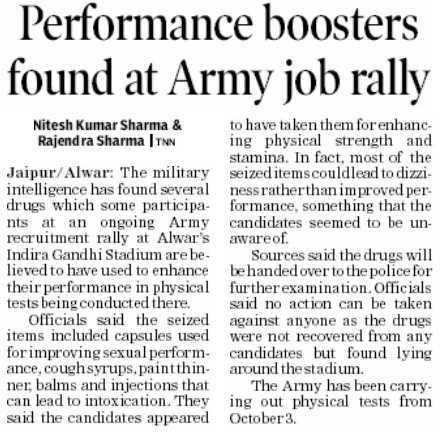 The front page news report of a reputed national daily on October 8, 2012, is headlined “Army HQ nod to foreign firm under scanner”. A picture of retired Gen V.K.Singh with the caption “Ex-Army chief initiated 'emergency purchase'” and the subtitle “$100 mn Tender – MoD finds Bulgarian firm not an original manufacturer; Russia complains”, clearly targets Army HQ. The news item concerns emergency procurement of anti-aircraft gun ammunition allegedly through an irregular selection procedure. This needs to be viewed in the context of the then Chief of the Army Staff (COAS) Gen V.K.Singh's April 2012 letter to the Prime Minister, in which he reported that there were military hardware obsolescence’s and deficiencies of ammunition and equipment seriously affecting the battle readiness of the army. This letter got leaked to the media. Even though Gen V.K.Singh demanded that the source of the leak be punished because it is treasonable, and the Raksha Mantri (RM) said it is a “breach of national security”, bureaucrats in MoD/PMO are soft-pedaling investigation because the ghost that caused the leak is right there amongst them. Among the questions that need to be asked are: “Why did Army HQ initiate emergency purchase of anti-aircraft (AA) ammunition?”; “Could not Army HQ have foreseen the requirement and projected it to MoD in the normal course?”; and, “Did glitches in procurement procedures result in inordinate delay and consequent shortage of AA ammunition, creating an emergency that would have serious operational repercussions?”. 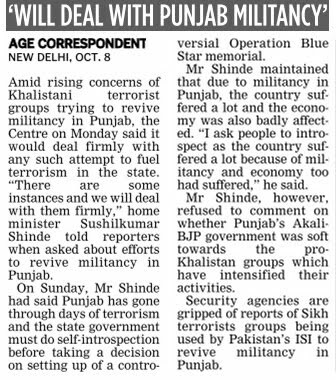 Also, if there is a military engagement with another country, can any COAS simply pack up the AA guns and tell the PM or RM, 'You have not provided the ammunition'? It is well known that defense procurement procedures are bureaucrat-controlled and corruption is indulged in by those who are in control. This is not to absolve Army HQ or COAS of responsibility but to point out that the dominant role in all defense procurement is that of the MoD bureaucracy, specifically, the Defense Secretary. It is only the COAS who would initiate emergency purchase precisely because that is the level of responsibility for national security. But the reporter apparently has not stopped to enquire why there was an emergency. 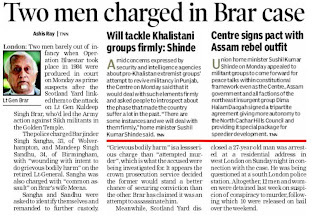 Targeting Army HQ by oblique accusation of corruption has inadvertently provided cover to corrupt officials. In any case it would have been more appropriate to paste the Defense Secretary's picture with the news report. Gen V.K.Singh's courageous, path-breaking and openly-declared condemnation of corruption among the nexus of corrupt bureaucrats and certain retired army officers, together with the unassailable honesty of RM A.K.Antony, have discomfited the MoD bureaucracy. Hence it is necessary for them to target Army HQ and Gen V.K.Singh to divert media glare away from them. 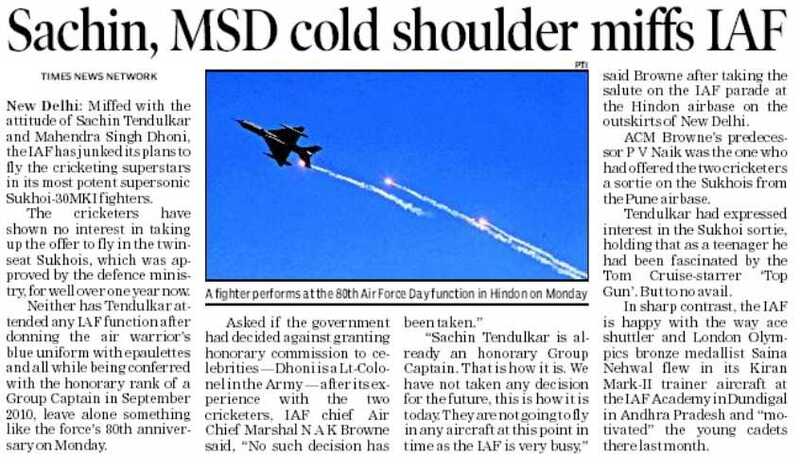 It is unfortunate that the media has been misled by information provided by MoD bureaucrats, without asking questions on the lines mentioned above. One sincerely hopes that there is no bureaucrat-media nexus in this case. **S.G.Vombatkere served 35 years in the Indian army and retired with the rank of major general from the post of Additional DG in charge of Discipline and Vigilance in Army HQ, New Delhi. He is presently engaged in voluntary work and is a member of the National Alliance of People's Movements (NAPM) and People's Union for Civil Liberties (PUCL). 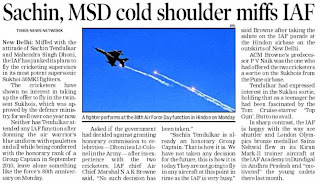 NEW DELHI: The Supreme Court today refused to restrain the Centre from training Sri Lankan armed forces saying it is a policy matter of the government and it cannot interfere with it. A bench headed by justice Aftab Alam refused to entertain a petition seeking its direction to Centre not to provide training facilities to Sri Lankan armed forces in the country. The bench dismissed the petition terming it as "misconceived." Petition was filed by one N Raja Raman who had approached the apex court after there were some protests from a section of the public, including politicians, against training of Sri Lankan army in India. In August, Tamil Nadu CM Jayalalithaa has requested PM Manmohan Singh to instruct the defence ministry to immediately halt the training being given to the two Lankan defence personnel and send them back to Sri Lanka immediately. Jayalalithaa had in July strongly opposed the training being given to nine Lankan defence personnel after which they were relocated to the Yelahanka air station at Bangalore. She had insisted that they should not be trained anywhere in India, saying the desire of Tamil people was to see those (Sri Lankan defence forces) charged with war crimes (during the last leg of the 'Eelam' war) being punished.